Andrea Collesano is a liquid artist, able to dictate his visions with finesse. His works of art submerge caress and go beyond. His almost indelible ink is the best technique to describe fauna and sea on a skillfully handcrafted, never uniform paper. I saw the whales I feel like shouting out all this varied universe. Animal figures hung in the sky, floating clouds of inspired desire. Those huge cetaceans swallow water and hold back not only breathe but, due to their age, surely also all the memory of Earth. 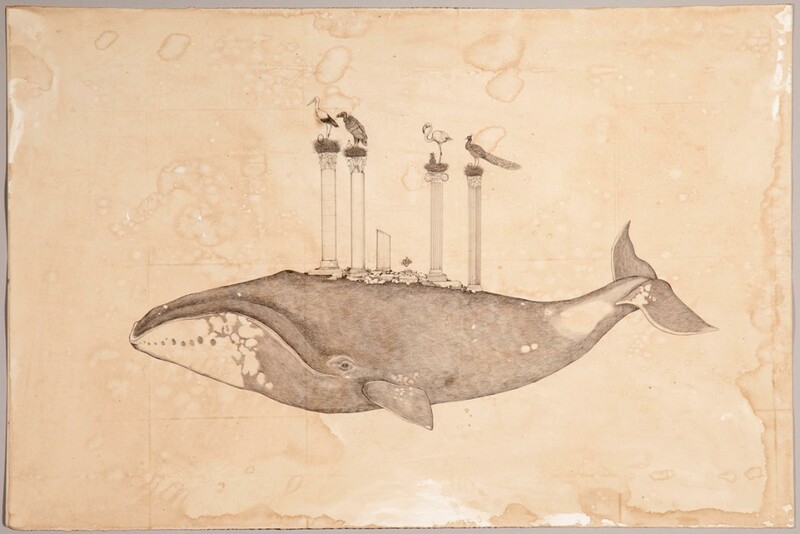 The sperm whale, this huge divine animal, strong and tough, rounded and ancient hold up everything (who knows for how long) starting from the world of ideas. The animal, never completely asleep, breathe suspended and always in excellent company: octopuses, transparent jellyfishes, seahorses, barely twirled long snakes and suffering hearts and a lot of keys without keyholes. The blue whale, no more a literary monster, is a bearer of awaited meanings. They are monster of an unknown world, scarcely touched by the scuba diver and the respectful fisherman. The human being, great absent, in Collesano’s work is (maybe) devoured, protected by those immense creatures or more easily vanished because unimportant and intrusive, even the landscape is barely sketched in thin cliffs. On the background we can se, sometimes, a lighthouse. Collesano’s drawings, even if accurate, are not simply naturalistic illustrations, they just preserve the discreet charme of life forms. They’re drawings that pleasantly corrupt time breaking his limits, norms and boundaries. The artist’s pieces are totally lacking of trivial suggestions of meaning, of any possible discovery of treasure. They are maps, treasures themselves. Pleasing images to carry along, on the skin and inside like a brain tattoo. Those maps are precious talismans: mysterious spells without gravity. Ink on paper, set with transformations yet to come. A love blessing that is not possible to explain, but certainly clear.